On a pleasant evening, we were sitting at Gurjar ki thaddi [a Gurjar community man’s tea stall], Sherpur tiraya, sitting near us was a man whom I can best describe having moustaches like FSR, a huge but firm belly like that of Kala Sahib, as tall as DK, piercing eyes like Collin’s, he spoke non-stop, enchantingly; with people listening to every word like drops of sacred knowledge.. . Just like GSR’s talks and he had a jovial manner reminding me of Dicky singh. He wore a Sadhu’s chola [Hermit dress], he came towards us, we thought he was a needy and offered him some money, but he refused and instead introduced himself ‘Hello dear friend, I am Jogi of the Jogi Mahal of Ranthambhore National Park’, I do not need any money, I come to you because I want you to make the recent incidences of the park reach to the people’. He said ‘I take people’s help as I, directly cannot reach the masses’. The blog is not intended to offend any person or department. As you will go through it you will realise this blog is a concoction of fiction, reality and author’s personal thoughts. 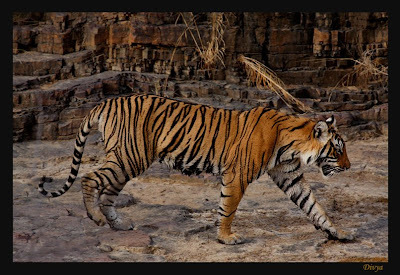 Jogi started with the Berda tigress’s tale, he described the Berda tigress as the real wild ferocious tigress of Ranthambhore National Park [RNP], with a beautiful glowing coat and her mesmerising grace would leave you in awe, the youthful tigress aged 5+ years had just delivered her first litter. She and her two beautiful cubs were settled in zone 4 of the park. In her motherly care & supervision her 19 month old cubs had grown even bigger then her, she was very fearlessly bringing them up. One day she was spotted injured by a tourist guide Nafis and the Forest Department [FD] were informed about the injured tigress. The DFO sprang into action, he asked to arrange for three things first.. .
1) A pada [young buffalo calf], 2) a canter filled with fire wood, 3) a team; comprising of a WII person, a doctor, the ranger of that range and some forest guards. The moment he heard this, the poor veterinary doctor thought he had given the most erroneous answer of his life and he should not have said this at all. Just then he received another phone call, this was from the district collector’s office ‘Doctor Sahib, you have to go to treat the tiger...’ In a small place nobody declines the District Collector’s order. The DFO’s honking vehicle forced the doctor to leave the house with a heavy heart. Peter was on field and hence was out of range on his cell phone. He then said to find the whereabouts of the WII guy researching on wild boars; one of the perplexed ranger asked ‘Sir, how will wild boar researcher help for tiger’s treatment?’ the DFO said, ‘As a rule we need a WII person’. Sadly even he was not available... Now, with no other WII personnel left to fill the spot the rule follower DFO ordered somebody to get the WII vehicle and the WII driver to be present on the spot where the tiger was being treated. DFO calling out in louder voice ‘Ranger Sawai Madhopur’, the Ranger in sharp attentive voice ‘Yes sir’. DFO said ‘WII’... the WII vehicle driver said ‘Yes sir and present with the WII gypsy ’. DFO said ‘I see, we shall make you and your family see many tigers next time you visit the park, now start the treatment. I will help you with the procedure’, he asked the doctor ‘Doctor, what experience do you have in large mammals’ the doctor replied, ‘I know how to give medicines to cattle’ the DFO said ‘Ah! Fine, then get that pada [buffalo calf] I had ordered and let the doctor give the medicine to it, the tiger will kill and eat it, and get cured’. The doctor happy that he would not have to treat the tiger directly; without any arguments gave a huge injection to the buffalo calf and the guards of the forest tied the calf near a tree and returned to the forest office. The wildlife trained ranger of Sawai Madhopur range asked ‘Doctor Sahib, Why did you give steroids to the cattle... will it not get charged and injure the tiger? The slightly baffled doctor replied that he carried just one injection with him and didn’t know any other medicine to give to tiger, the steroid will give push to the injured animal and it should help. The next day they found the tigress dead in the woods....with no sight of the buffalo calf around! One ranger commented ‘Hope that the buffalo calf didn’t get extra strength and ended up injuring the tigress? The DFO in grim tone said ‘I knew this would happen, anyway we did our best…’ and immediately he called upon the canter filled with fire woods that he had got arranged along with the doctors arrangements the previous day. They set the cremation ceremony inside the park, after the formality of a post mortem. That day the sun set upon the beautiful Berda Tigress. The story might be exaggerated; it might even be completely fictional however few questions still stand there, which make us ponder about the Forest Department’s draw backs in the Berda Tigress’s death. What are these questions? Why is there no veterinary team in the Forest Department? 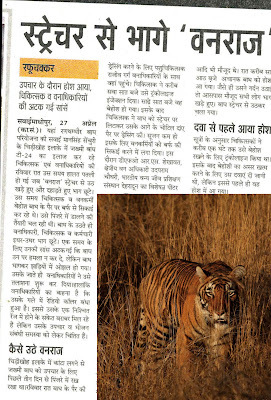 1) Ranthambhore doesn’t have any Wildlife veterinary doctor. 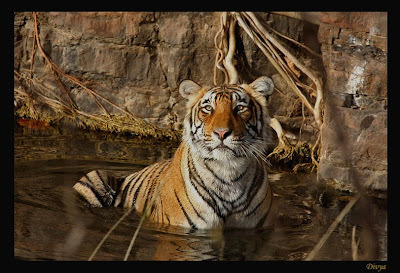 In the past two years at least 10 big cats have suffered such incidents, there is no Wildlife trained veterinary doctor in a prime tiger reserve like Ranthambhore. Another recent example: T24, a male tiger having some mysterious injury in his leg was under treatment by the same veterinary doctor’s. The news published in a Hindi local paper as below. 2) There is no facility to keep injured wild animal in captivity during treatment. 3) When a tiger/ leopard dies, its post mortem is conducted in a hurry and in really pathetic conditions and never is any media, independent researcher or NGO called in hence there is zero transparency in the entire procedure. The forest officials’ hurry to criminate the big cat as soon as possible before it reaches the public eye just to hide the real facts? 4) No protocols for post mortem of dead animal are being followed. Post mortem of a dead leopard inside the jungle, to keep away media and conservationists from asking questions. 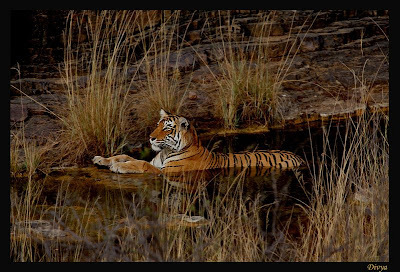 However, after the death of Berda tigress, her voice reached National Tiger Conservation Authority [NTCA] and this Berda tigress has changed things. The post mortem procedures will be more transparent now... thanks to NTCA. As you are aware, a detailed advisory containing post-mortem format has already been issued from this end for carrying out post-mortem of wild animal carcasses found inside tiger reserves. 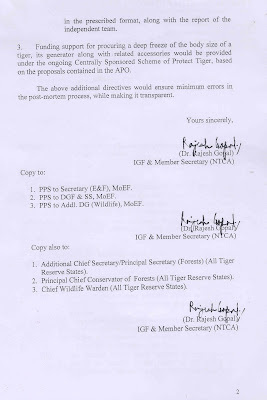 It is hoped that the said advisory is being followed meticulously in the interest of tiger conservation. However, time and again, due to rapid disposal of tiger carcasses by burning, criticism is being received from several quarters. (i) All tiger carcasses should be preserved in deep freeze until an independent team analyses the cause of death. © a non-governmental outside expert nominated by the Chief Wildlife Warden of the State. 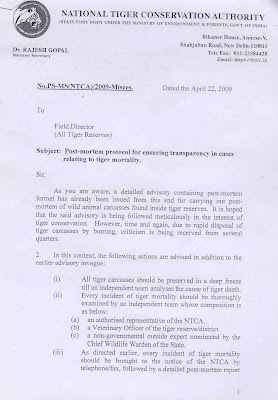 (iii) As directed earlier, every incident of tiger mortality should be brought to the notice of the NTCA by telephone/fax, followed by a detailed post-mortem report in the prescribed format along with the report of the independent team. The above additional directives would ensure minimum errors in the post-mortem process, while making it transparent. The NTCA directives which have been enforced will prove to be an important decision due to which facts will now be in black and white after the death of a tiger. Read these words with great heavy heart and came to face with reality of Tiger,it is shameful on part of the Park Team for what they've done.Story here may be a bit fiction but this is reality of Our Treasure.An eye opening blog ! Really appreciated ! An effort has been put to research whats written and pasted. Good Effort , keep it up ! . Is there some kind of association or someone or a small group taking some concrete steps, if there is any such movement , I would like to be a part of it. Since you are already leading it. Divya's blog has an interesting character-Jogi, who has a number of identities. The law portion and NTCA directives is good learning too..
Good work Divya.you have some great story writing skill. Looking forward for more jogi's adventures. Absolutely Astonishing pictures with very beautiful narration. Keep up the good work. My best wishes always with you. 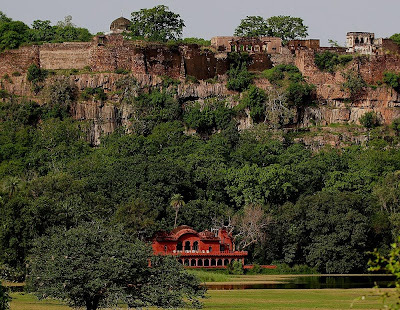 There's no surprise no veterinary doctor has been posted in Ranthambore. If you look at most of the government run hospitals (for humans), you will see the same pathetic situation. If only you knew how autopsies are conducted on human dead bodies in government hospitals.. Not much difference there compared to the leopard autopsy, believe me. What do you think? Will the orders on paper work?